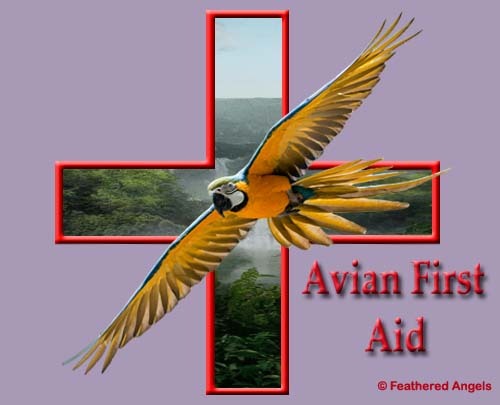 Got another wonderful idea today from Lyne Paulsen on being prepared for an emergency with our Feathered Angels. Have your parrot carrier for each bird, with a zip lock bag taped to the top is each bird’s name and copy of health record, and micro chip number in case we get separated. The vet’s name and number and food likes and dislikes. A 10 pound metal canister of food 5 gallons of water, extra blankets, flashlights, battery operated fans. Also have a generator that is tested monthly on hand. There is so much useful information in just this one volume. What’s more, there is a symptom finder, allowing a quick overview of possible causes of given symptoms among dogs and cats. There are two tables of poison hazards, including one which tells what human medications should never be given to cats (although veterinarians advise that no human medications should ever be given to animals without checking with them). The animal conditions that can be helped by first aid range from life-threatening situations to such usually-minor things as constipation in cats. There are many helpful diagrams. One of them shows how to make a homemade Elizabethan collar and another one shows how to restrain a seriously-injured animal for the trip to the vet.